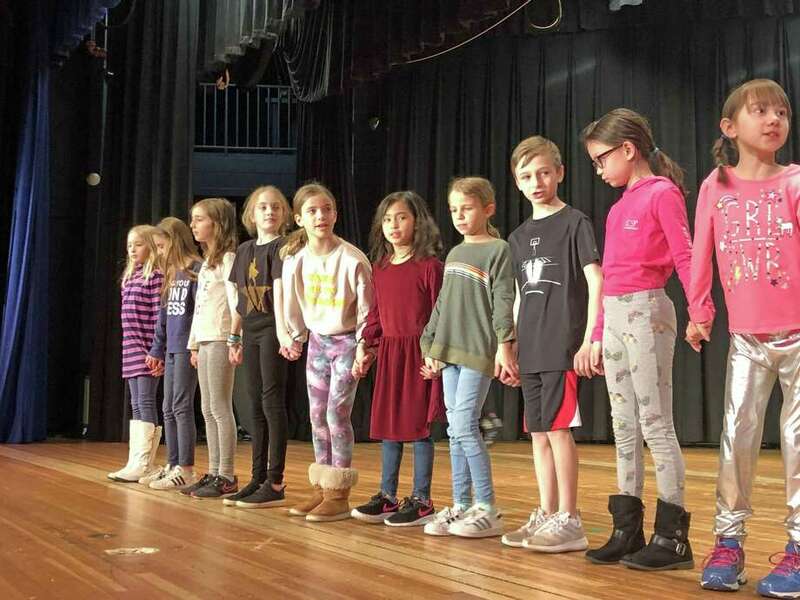 Students from Saugatuck Elementary School are rehearsing for their production of "Willy Wonka." This is the first theatrical production from the newly formed Saugatuck Theater Club. The performances will take place on March 29 at 7 p.m. and March 30 at 2 p.m.
State Sen. Will Haskell, D-Westport, and state Rep. Anne Hughes, D-Weston, joined the future leaders of Weston’s Ms. President during their daylong tour of the State Capitol. Haskell and Hughes joined the young women to discuss important bills and encourage them to pursue public service. With the women of Weston Ms. President sitting in legislators’ chairs, Haskell and Hughes sat opposite them as if testifying at a public hearing while the girls discussed legislation they find important. Several girls emphasized their interest in proposed legislation that would reduce the pollution of plastic bags, as they are concerned about protecting the environment. They also discussed a bill to ban single-use plastic straws in an effort to reduce waste in the Long Island Sound. At Bedford Middle School, in the music category, Charlotte Franklin’s “The Fire Within” garnered third place. Staples High School students took a whopping three first-place finishes: Juliette Saviano in dance, Greta Gilbert in literature, and Chloe Chaple in film. Dylan Goodman won second place in music and Rachel Varsano placed fourth in visual arts. There will be certificates awarded in the following categories: Best Development of Theme, Best Youth Organization Float, Most Creative, Best Community Organization, Most Colorful, and the Best Overall Float. On Memorial Day (May 27), the parade will begin at 9 a.m. The route begins on Riverside Avenue, continues east on Post Road East, to Myrtle Avenue, to Main Street, and ending at Parker Harding Plaza. Memorial services will be held on Veterans Green immediately following the parade. If the parade is canceled, services will be held at 10 a.m. in the Westport Town Hall Auditorium. SpeakEasy, a newly launched quarterly Speaker Series is pleased to announce its premiere event on March 28 at 7 p.m. and will feature Craig Melvin, anchor for NBC News “Today” and national correspondent and anchor on MSNBC. The event will take place at the Weston Public Library. Admission is free of charge and advance registration is available https://bit.ly/2G0j264. This will be a one-hour questoin-and-answer session. Given the state of news, media, and politics, it will be a timely and relevant dialogue. A complimentary reception will follow the talk. SpeakEasy is organized by a few Weston neighbors who established an advisory committee with generous support from the Weston Public Library and friends of the Weston Library. Tom Scott, founder of The Nantucket Project, will be the second featured SpeakEasy participant on May 5 at 4 p.m. at the Weston Public Library. Gretchen T. Wright has joined Westport Country Playhouse as director of development, effective March 4. She will be responsible for the professional, nonprofit theater’s annual sustaining support from public and private constituencies, including corporations, government agencies, foundations, and individual donors. Wright comes to the Playhouse from the Alliance Theatre in Atlanta, where she was development manager for special contributions and brand awareness, and was involved in fundraising efforts for the theater’s 50th anniversary season. She also co-developed a business plan and sales strategy for the Alliance@work corporate educational program. She was previously an associate consultant with Organizational Performance Group in Woodbridge, orchestrating strategic plans and other organizational development projects for an array of clients, including nonprofit theaters. Wright was with Yale Repertory Theatre as associate managing director, and served Yale Summer Cabaret as managing director. She was also with the Court Theatre, University of Chicago. The Westport Woman’s Club is inviting the public to a Spring Fashion Show on March 23 at 11 a.m. at the WWC clubhouse. Purchase a ticket and attend this WWC luncheon and fundraiser to see the latest in spring fashion, modeled by men, women and children from our local community. Ticket includes a noon luncheon, modeled spring fashions from local Westport vendors Splash of Pink” and Southern Tide, an array of silent auction items, a pop-up store opening at 11 a.m., and more. Event chair Ana Hitri, shares that all fashion and auction item purchases at the Spring Fashion Show event will support WWC charitable causes within Fairfield County. Tickets are $50 each and available at www.westportwomansclub.org (under 18 years, tickets are $30 each). Ticket sales for this event are open to the public.